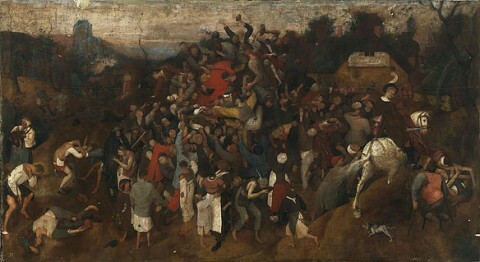 The Wine of Saint Martin’s Day, a Bruegel painting recently discovered by the Prado Museum. Image courtesy of the New York Times. The Museo Nacional del Prado in Madrid, Spain has discovered a painting by sixteenth-century Flemish master Pieter Bruegel the Elder. The painting, The Wine of Saint Martin’s Day, is dated between 1565 and 1568. Belonging to private collectors, the painting was brought to the Prado to have it studied and cleaned before the owners planned its sale. During the restoration, scholars of Flemish painting were invited to share their expertise. 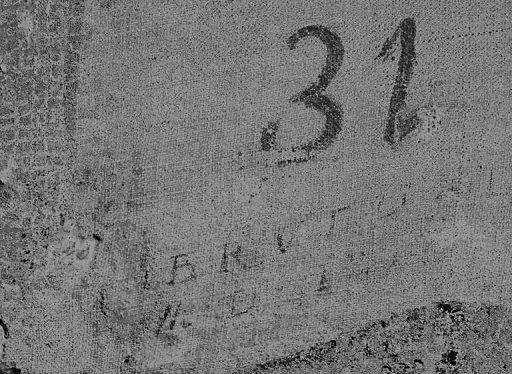 After an x-ray on the 4.8 x 8.9 foot canvas revealed the artist’s signature, its authorship was confirmed. The painting had previously been attributed to Bruegel’s less illustrious son. Bruegel’s signature on the back of the canvas. Image courtesy of the AFP. More text and images after the jump…According to the Associated Press, the Prado hopes to acquire the work for 7 million euros, a third of its estimated market value. (Spanish newspaper El Pais estimates the value to be 25 million euro.) The owners, Spanish collectors, would rather the work be placed in the Spanish public collection than to disappear into the free market. In an interview with the BBC, Spanish cultural minister Angeles Gonzales-Sinde announced on Thursday, “The discovery of a Bruegel is an exceptional event and not something that is likely to be repeated.” There is only one other Brueghel work in the Prado’s collection, a 1562 work, The Triumph of Death. Spanish cultural minister Angeles Gonzales-Sinde inspects the masterwork. There are only 40 existing paintings attributed to Breugel, and this discovery makes 41. An ancient engraving referenced the work, but scholars long believed the painting to be lost. The Wine of Saint Martin’s Day is one of Breugel’s largest canvases, and was painted in tempera, a medium Brueghel seldom used. Preferring oil painting, Breugel specialized in landscape and genre paintings which illustrated the life of peasants. The scene from the recently discovered canvas depicts a debaucherous crowd attempting to sip the year’s first wine on St. Martin’s feast day. Martinmas, as it is also known, marks the end of autumn and the beginning of harvest season. This entry was posted on Sunday, September 26th, 2010 at 11:13 am	and is filed under Art News. You can follow any responses to this entry through the RSS 2.0 feed. Both comments and pings are currently closed.